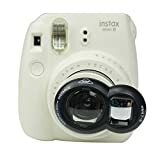 Fit for fujijfilm instax mini 8 camera/ mini 8+/ mini 7s instant camera. Let your instant film camera mini 8 or mini 8+ film camera to focus as close as 40-60 cm from the object, great for group shots. Fashion cute appearance design for your instax mini camera will stand out. Easy to install and take the selfie instant photos, convenient to use for all your instant nice life. The funny and cute mini close up lens for instant mini 8 /8+/7s, Modern and luxurious premium, practical design and exquisite workmanship, combination practicability with popular fashion. This selfie lens for Fujifilm Instax Mini 8/ Mini 8+/ Mini 7s Instant Camera.The mini 8 lens is great when you want to take a close-up film photos or a self-shot film instant pictures.Lens cloth can make your camera clean. Mini8/ 7s special self-protrait mirror,special for the Close-up lens and Reflectors of all the model 8/7s camera.Close-up Lens is easier focus on the people or item,shortening 40cm-60cm while taking photo,it can make the picture better, installing directly in front of the mini7s/8 camera lens. fujifilm instax camera not included. Suitability It’s funny and cute fujifilm instax mini 8 selfie lens. Don’t observe the sun with the naked eye through the mini 8 close-up lens to avoid burning eyes.